Back in Feb 2018, Red Kite applied to build 6 dwellings on an area behind Foxes Piece currently used for parking. 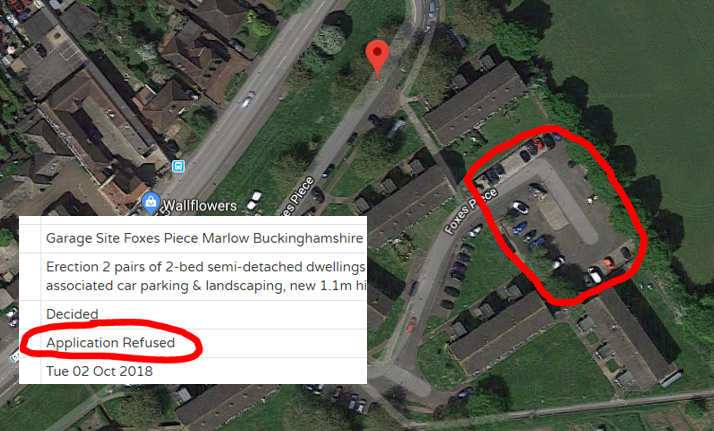 The obvious issue was loss of parking spaces for residents, and objections were made by Marlow Town Council and a HUGE number of Foxes Piece residents, and other locals. Some resident objections were very detailed, even including photographic evidence of vehicle parking volumes etc. There were approximately 100 objections, so very significant and thus a very powerful voice of opposition. The original application included parking surveys, and proposed locations where resident could park. It even seemed to suggest that parking along the A4155 Little Marlow Road would be an idea!? Welcome to Marlow Green – our new greengrocers!